Pure comfort food made quickly in your electric pressure cooker. 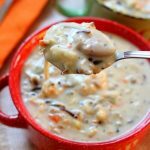 It’s a thick and hearty soup made with wild rice, brown rice, seasonings, vegetables and tender bites of chicken. You can also substitute leftover turkey in this soup. No rice-a-roni packages or pre-packaged foods are used in this version of the soup. Add chicken, celery, carrots, water, bouillon, rices, pepper, salt, parsley, sugar, garlic powder and thyme to the Instant Pot. Lock the lid into place. Make sure valve is set to sealing. Push the manual high pressure button and set the timer to 25 minutes. When the timer beeps let the pressure release naturally for 10 minutes and then move the valve to “venting” to release the rest of the pressure. Remove the lid. Remove the chicken and shred it or cut into pieces. Put the chicken back into the pot. Melt the butter (I melted mine in a glass bowl in the microwave). Stir in the flour, a tablespoon at time. It will make a cookie dough type consistency. Ladle in a cup of the broth of the soup and stir until creamy. Turn the Instant Pot to the saute setting. Add the mixture into the Instant Pot and stir. The soup will thicken up. While it’s thickening, stir in the half and half. Salt and pepper to taste. Ladle into bowls and enjoy! Wild rice: wild rice is black and can be sort of hard to find. It’s also kind of pricey. I went to the bulk section at my grocery store (winco) and bought just the amount I needed, a half cup. Better than Bouillon Chicken Base: I love keeping this stuff in my fridge. It tastes so much better than regular bouillon. I buy a big jar of it at Costco. If you don’t have this or can’t have it for dietary reasons than simply use chicken broth instead. You can use 4 cups of chicken broth and 2 cups of water. Half and half: this is just an equal blend of whole milk and light cream that is sold in a carton. If you want to use milk instead you can totally do that. You can also just evaporated milk.